I have a serious problem. 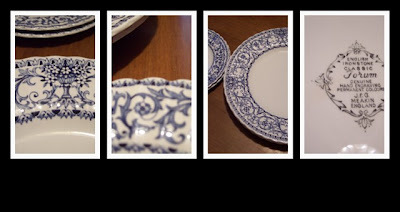 I have a major blue and white dish addiction! I love all kinds of dishes as you all know, but for some reason, I cannot pass up pretty antique blue and white dishes. It is just impossible. I walk into a thrift store, some freaky thing happens to me and I go on autopilot straight to some kind of blue and white dishes they have. Maybe I should open up a "Blue & White Dish Store". Oh, wait! that would mean I would have to actually sell my dishes! I know, how about a "Blue & White dish Rental store"! Any way, here are my latest loves. I got 2 dinner plates and 2 salad plates. 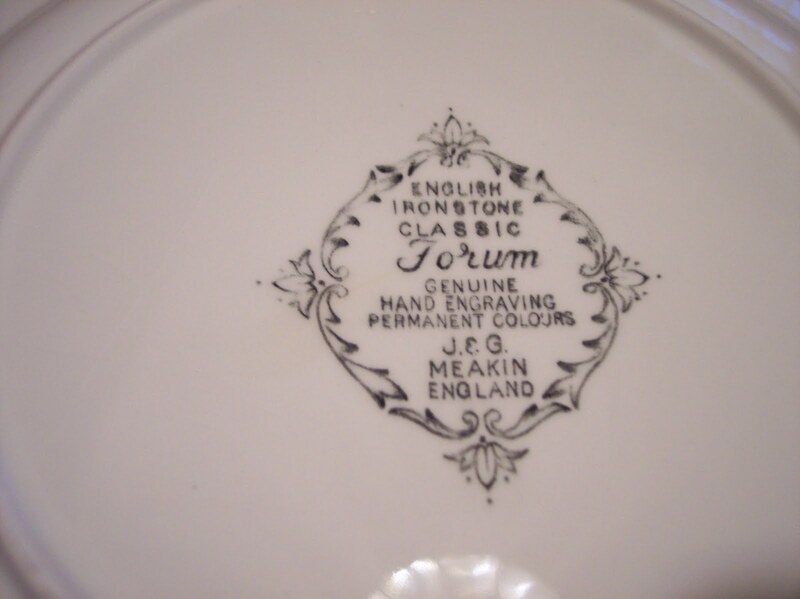 Can't go wrong with gorgeous Ironstone made by Meakin! They have a pretty scalloped edge to them. 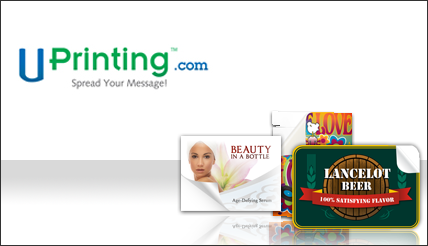 I'm excited about this new giveaway from UPrinting! They have generously offered one of my readers 250 stickers/labels! Aren't these awesome! There are a gazillion different ideas and styles to get. Etsy store labels, craft projects labels, address labels you name it. So how do you win? Super easy! Just leave a comment on this post! That's it. Make sure I can find your email addy so I can inform you if you win! If you want a second chance to win, leave a second comment letting me know you are a follower (or just became one). This giveaway will end Sunday, May 23, 2010 (EST-Midnight). This giveaway is for US Residents only. You must be at least 18 year old to enter. 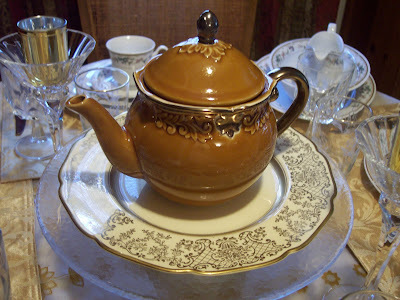 Don't forget about my Gold Teapot Giveaway going on until May 21, 2010!!! CLICK HERE TO ENTER! Loving your blue dishes...I honestly cannot fit another dish or tea pot around here... I need a shed at this point. Have a happy Week. Your blue dishes are pretty collectibles. The gold tea pot looks nice, I'll have to check out your giveaway. your blue dishes are very pretty. I do really like the design. You did a great job on the mosaics. Happy Blue Monday. 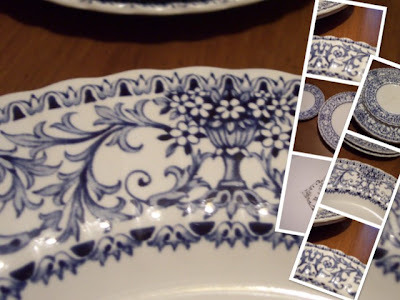 Love the blue & white dishes!~ Really pretty. You and I share some blue and white love! Those are incredible dishes and I could not have passed them up either!!! 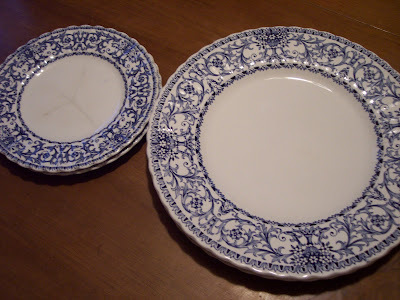 Oh wait, I found some blue and white dishes today myself! Yikes! I did only buy two place settings. I will share my photos soon. I think these plates are some of the prettiest you have shared! I am of course a follower!!! Diann, I'll rent from you- those are gorgeous!!! I always wonder who would give something like that up. Just beautiful! You are so right - Meakin was a great manufacturer of fabulous transferware - your new dishes are a fabulous find! Lovely pattern. These are all so gorgeous! 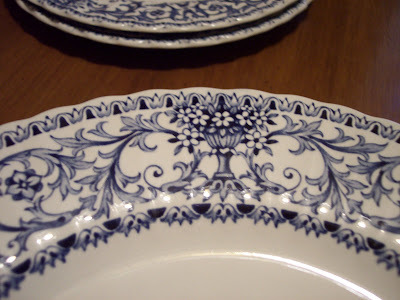 I love blue plates too..so gorgeous! Great shots! yay! I am charmed by the blues! 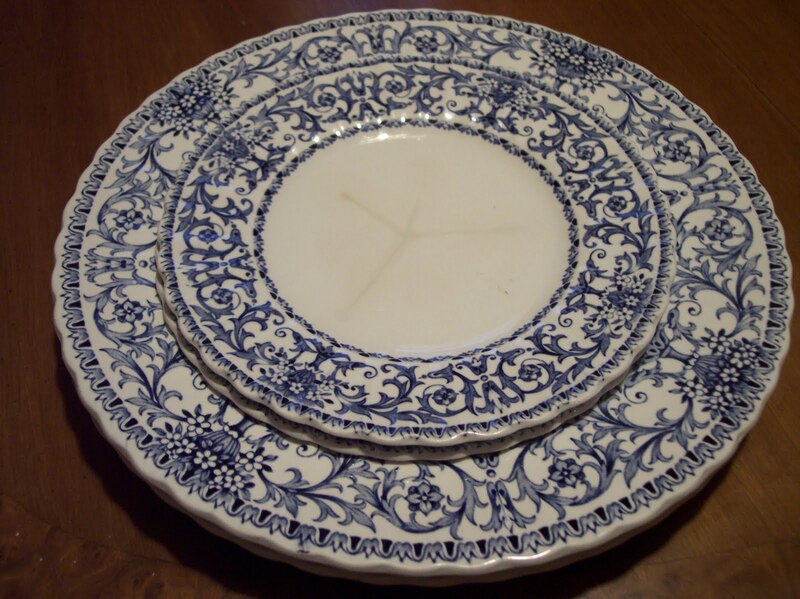 Those are the prettiest blue and white plates I can remember seeing. Great buy. Hi Diann! 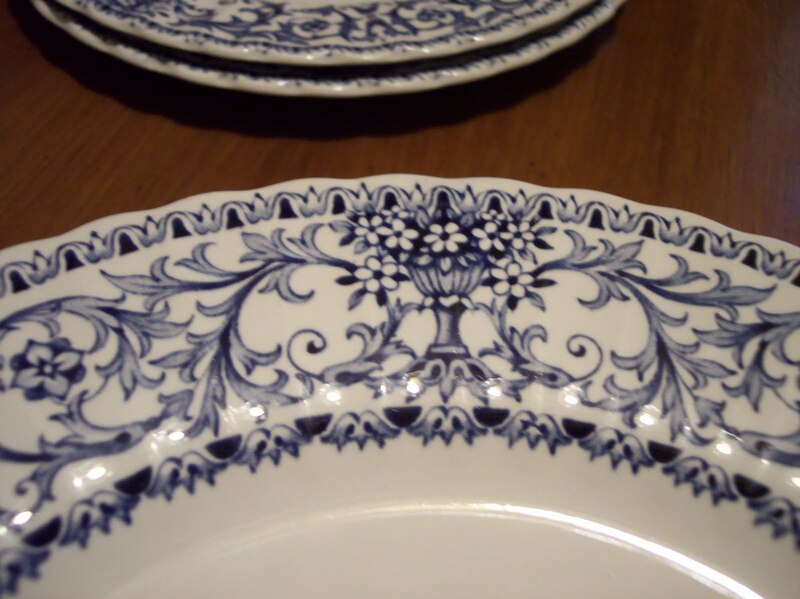 Oh, your blue and white dishes are so beautiful! I don't think I've seen this pattern. Thanks for popping in to see me. I love your blue and white dishes! They're gorgeous! There are two things I really love, blue and white and ironstone, and you have them both! Your china is just beautiful! Thank you so much for joining my first blog party and for your support! I so appreciate it!!! And thank you for getting the word out! First.. I LOVE blue and white..
but we all know the 10 commandments..
and could really use some address labels.. I love your new dishes Diann! 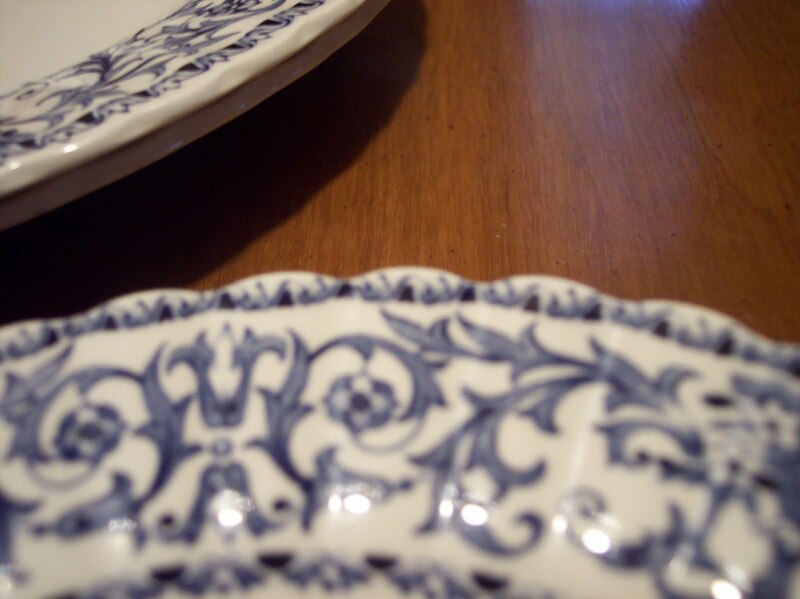 You sound like me when it comes to blue and white dishes! If I ever had to give up any of my dishes, I certainly would not be able to part with my B&W's and especially not my Blue Willow! I would love to be entered for a chance to win 250 labels! I could certainly use some new labels for my baking business. With an upcoming move, I could certainly use some new labels! Thanks for the opportunity. I can always use address labels! Count me in! Yes, I would love to win these labels! Thanks for the reminder!